David Beasley, the head of the World Food Program, visiting Sanaa, Yemen, where the world’s worst hunger crisis has been unfolding for at least a year. “My primary concern is the innocent children, women and men of Yemen, and I urge all parties to end the fighting and support efforts to build peace,” said David Beasley, WFP Executive Director, in a statement on Wednesday. 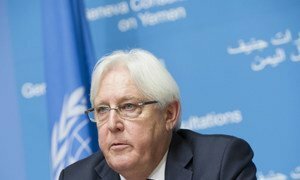 “Only an immediate cessation of hostilities will give the humanitarian community the sustained access it needs to provide the food and other vital assistance needed to save Yemeni lives,” he added. Yemen is facing one of the world’s deepest humanitarian crises with 22.2 million people in need of life-saving assistance, including food, safe water, nutritional support and basic medical care, according to the UN Office for the Coordination of Humanitarian Affairs (OCHA). The country’s economy has taken a nose dive since conflict between government forces and their allies, to quell Houthi rebels, escalated in 2015. There has been a 180 per cent depreciation of the Yemeni Riyal in three years. The cost of basic food items has increased by 35 per cent in the past 12 months, leaving many families unable to feed themselves, leading to the world’s largest hunger crisis, with 18 million people – two in three Yemenis – not knowing where their next meal will come from. International food assistance, most of which is provided by WFP with 6 to 7 million persons reached every month across the country, has been critical in preventing the country from descending into a full-blown famine, but, according to Mr. Beasley, “in the face of growing obstacles and risks, we are now reaching the limit”. Though the agency intends to scale up its capacity in order to reach up to 8 million people per month, the Head of WFP warns that “if the conflict continues to intensify and economic conditions further deteriorate, we could well see the number of severely food-insecure Yemenis increasing to 12 million”, he said, explaining that “with limited access, escalating insecurity and further damage to the country’s infrastructure” the organisation’s ability to deliver assistance to this number of people would be “extremely challenging”. 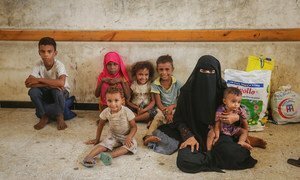 Warning that “time is running out for aid agencies in Yemen to prevent this country from slipping into a devastating famine,” the Head of WFP called for new entry points for humanitarian and commercial food imports and a free-flow of commercial and humanitarian food inside the country. “I urge all parties to the conflict to meet their obligations to protect civilians and civilian infrastructure and take active steps to respect international humanitarian law by ending the conflict and bringing the peace that Yemen so desperately needs”. Fighting in the Yemen port city of Hudaydah which has damaged a World Food Programme (WFP) storage facility, threatens to hamper efforts to feed millions of people in the war-torn country, it said on Friday.